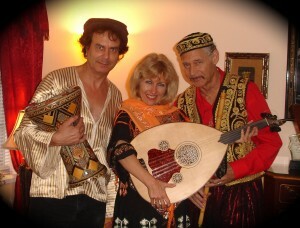 Tahja's Gypsy Band features a wide variety of world music from Europe, Eastern Europe, the Mediterranean basin, the Middle East, the Americas, and Polynesia. Our music stirs the soul and inspires the wanderlust in any would-be gypsy. We are a unique World Music Show Band. Our talented musicians play music from around the world on several instruments and sing in 40 different languages. 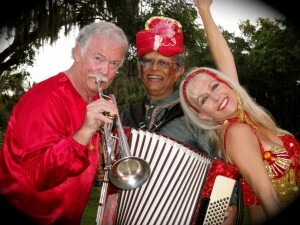 We can be booked as a band, or include a dance show, guaranteed to spice up any event! Click below to enjoy some songs of our band, and further below are some of our music videos. Thank you for your support of World Music! Enjoy some of our music videos below! We have a large data base of fans and are seeking venues in South Florida that would like to be on our concert calendar. We have over 20 years experience and are based in Sarasota. If you are interested to be included on our calendar, please call or email for details. We are a collective of entertainers who are linguists as well as musicians and singers, ready to bring an authentic sound to your special event. We offer free consultations for ethnic events to help you attain the most authentic feel. International Productions by Tahja (941) 349-3494. We make any party an international event!